3DFF-222 | Product | MIMAKI SINGAPORE PTE. 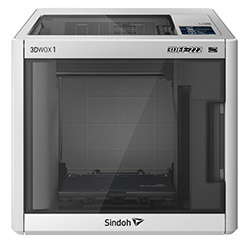 LTD.
3DFF-222 (*1) is a desktop 3D printer using FFF (Fused Filament Fabrication) technology (*2), and forms objects of sizes up to 210 x 200 x 195 mm (8.3 x 7.9 x 7.7 in) (W x D x H). It is a perfect partner for Mimaki flat-bed UV printers in a wide range of applications like in-house production of print jigs, three-dimensional signs, and manufacturing of molds for vacuum forming. *2: A method for forming 3D objects, which uses a filament of plastic resin which is molten by heat, extruded from a nozzle, and deposited layer by layer.